If you’re not shooting your food photos in your own kitchen or studio, before you can begin styling food and shooting food photos, you have to pack up and transport your gear. Choose a camera bag to fit your style, downsize your equipment needs so you’re not bringing your entire studio to the shoot, and pack your equipment so it arrives safely. A camera bag helps to protect your investment in your photo gear. 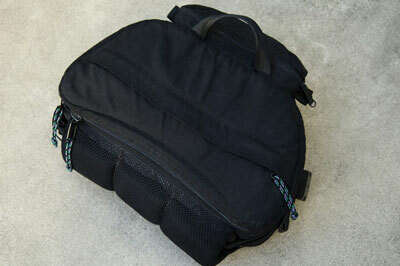 Numerous bags are available, designed to transport cameras, lenses, and other items. The bags range in size from small ones, snugly fitted to a digital SLR, to very large ones, designed to handle several cameras and lenses, a battery grip, and more. Some cases attach around a person’s waist and others go over the shoulder. A camera bag designed to fit around the waist. The larger camera bags have walls of thick padding that you can rearrange to accommodate all your camera equipment. The straps and handles are typically padded as well, which provide added comfort when carrying your gear. A camera backpack is a great option to consider. Carrying the camera, lenses, and so forth on your back will make transporting photo equipment to a shoot a little easier. Camera backpacks tend to also be very well padded, both inside and on the straps. Whatever option you choose for a camera bag, make sure it’s waterproof. You don’t want to get caught in a downpour and take the risk of harming any of your valuable and cherished equipment. You may have a lot of lights in your studio or home, including some super large, bulky soft boxes that don’t transport easily. Or you may like to have a choice of lenses at your fingertips to get a lot of variety in your shots, but when shooting off-site, cull down your equipment to the very basics. Instead of taking all your lights to an off-site shoot, choose a subset of your lights to bring. Honestly, two small lights and maybe one medium light is all you really need. Another good choice may be two small soft boxes and a diffused spot shooting across the back of the scene. Or simply two lights with a reflector may work just fine. Lenses can also be downsized for transport. Pick one or two lenses that will serve you well for a shoot. Perhaps start with a zoom, maybe something like an 18 to 55mm or a 24 to 70mm, and maybe one slightly long fixed lens (a 60mm or even an 85mm will do). When shooting food images, normal to slightly long lenses are typically used, as is the case in the following figure, although a wide shot now and then provides a unique alternative look. Lenses can be quite heavy, depending on the glass. Because of their weight and the transport considerations, you should limit the number of lenses you carry. In case you’re wondering, you won’t need your 200mm f/2 lens for a food shoot, so leave that puppy behind! 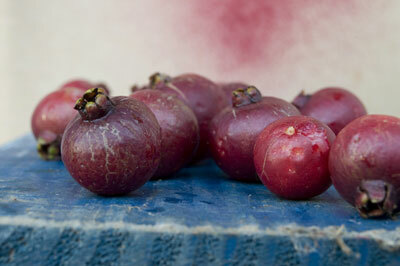 These red mini guavas were shot at 55mm. You can box up lights in any heavy-duty box and collapse the light stands (for the most part). You may want to choose a large plastic tub to transport lights. 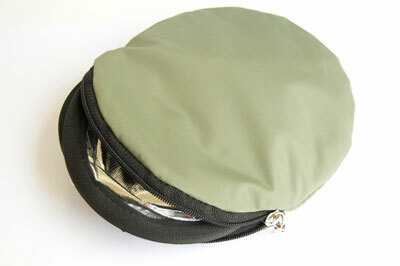 You can collapse pop-up reflectors and carry them in their small round cases, as the following figure shows. When packing breakable items, such as plates or glasses, wrap them in extra linens and fabrics that you’re also bringing to the shoot. Doing so keeps the breakables safe without having to deal with the extra bulk of packing material. Reflectors collapse in their cases, making them easier to transfer.